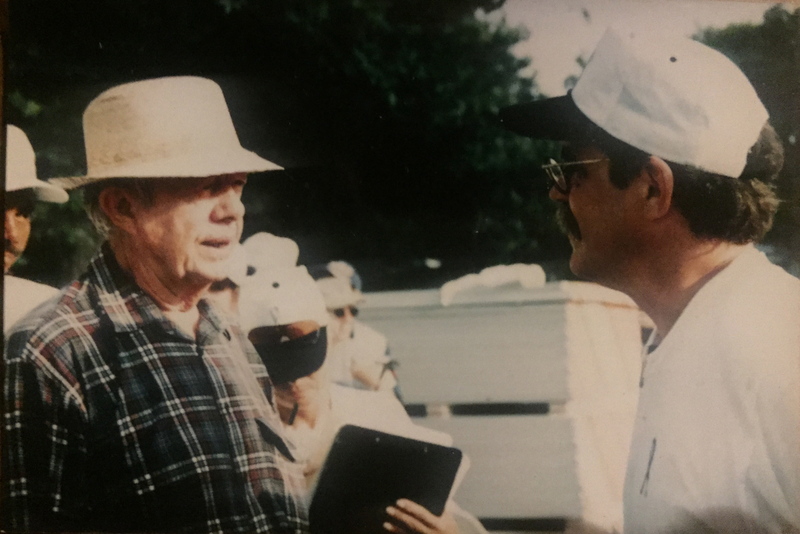 I met Jimmy Carter in 1998 when he came to Houston to help Habitat for Humanity build 100 houses in one week. Saint Paul’s Methodist Church quickly raised the donations to sponsor one of the houses, but, while recruiting volunteers, we found ourselves lacking in construction expertise. It seemed there were no professional builders or carpenters at the church. If we had needed lawyers or doctors we would have been ok. I volunteered to be on the crew, acknowledging that I was a pretty good handyman, but no builder. Never-the-less I was anointed the “house head”, a position way above my head. But with the help of an interior designer, an engineer and an insurance agent as the rest of the supervisory crew, and a great education program that Habitat offered us, 50+ of us met at 7:00 am one Monday morning in June and started building. We worked rotating crews for 16 hours a day and certified professionals (electricians, plumbers and hvac) worked during the night shift. President Carter came by the site almost every day, accompanied by secret service agents wearing fishing vests instead of suit coats to accentuate the casualness of the situation. Every day that week it got over 100˚. Volunteers came around every few hours to thank us for being there and make sure we were hydrated and fed, but Jimmy Carter came by to get the job done. After a quick introduction and a handshake, his first comment to me was something like “Do you have everything you need? It looks like you are a few hours behind on window installation, do you need help? Will the interior doors be installed today?” the next day “The sheetrock ceilings need to be hung today. Can you assure me you will get this done?”. He pushed us, encouraged us and motivated us. We finished our Habitat house on Saturday morning and the doorbell did not work due to an electrical problem. The family was delayed 8 days before they could move in because of a doorbell that I could have fixed, but not legally. President Carter moved on to his next project and I went back to painting decorative art and watering my 100 square foot garden near the University of Houston. Two years later I used much of what I learned there and built another house, the one I am sitting in now. I wish President Jimmy Carter the best of luck in his struggle against cancer. He is my model for outreach, religious values and helping make this world better. I wish there were more like him. Next Article Are you smart enough to be a sheep?